Friends of the Farms is a Bainbridge based non-profit organization whose mission is to preserve and enhance local farming. 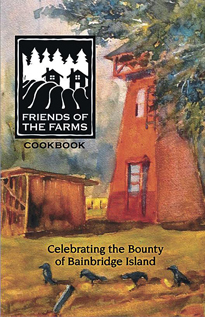 Celebrating the Bounty of Bainbridge Island (2012) is the organization's first published cookbook, featuring recipes that were collected from local farmers, chefs, educators, public officials, and community members. Each dish contains at least one ingredient that is grown either on or close to Bainbridge Island. For more information about Friends of the Farms or to order a copy of the book go to friendsofthefarms.org.